wheremmsgather: All Aboard the Tea Party Not-So-Express! All abooooard! Last call for the Tea Party Not-So-Express! Calling all tea partiers! For you adventurers who love the ocean, the sand, the sun, fishing, coffee, m&m candies, and touring beautiful lighthouses, this tugboat is for you! We are on our way to the beautiful province of Nova Scotia today with da Muddermark! We will be docking in Peggy's Cove. SnoSnot (aka JoJot aka Joanne) and da Muddermark (aka Mothermark aka Cindy) are already aboard, but they ducked outta sight when Bertie (for those of who do not know who Bertie is, she is my alter ego) took this photo of the Tea Party Not-So-Express tugboat. Seems they forgot to get their passports updated, but they absolutely refuse to miss out on today's fun so they are stow-aways. Word has it that some of our lovely Canadian friends are going to vouch for them at the border, so no worries about any illegal activities. The only thing you might want to be prepared for, though, is the fish part of this adventure. Seems we'll be required to catch about 42,000 pounds of fish on the commercial charter boat da Muddermark has signed on with on behalf of all tea party attendees. And, yes, you WILL be required to bait your own hook! Bertie acquired some special fish bait to lure some fishies to come along her; you can see some of them happily swimming right next to the Tea Party Not-So-Express tugboat. Just think how tired they are going to be by the time they arrive at Peggy's Cove....just in time for the fish slingin' contest Bertie heard about. Da Muddermark is giving her entire stamp collection to the tea partier who can fling their fish the farthest! Woo-hoo! So bring your fishin' pole and gear; wear your fishin' attire; enjoy the beautiful sights in Nova Scotia; and party down with your tea partyin' friends today. You don't even have to bring your own lunch. Bertie is servin' espresso, lattes, regular coffee, and m&m candies on the tugboat to hold ya'll over until lunch that is bein' served up by Sabrina and MariLynn! The menu? Why, fish, of course! So, if you decide to join us today, you can go to da Muddermark's glob for all the slimy details! Author's Note: I have so come to love Teapot Tuesday as hosted by Mothermark. We have so much fun and now Cindy even has her very own challenge thread on Splitcoaststampers that you can check out here! Please come join us. We need all the fishermen we can get today if we're going to catch 42,000 pounds of fish!! Ooh!! Love your ocean scene Charlene!! Too cute!! I have a df who is on a cruise right now. I am afraid your ocean scene is as close as I will get to a cruise since I would get deathly ill on a cruise. I get car and motion sick, can't even imagine being on a boat! Thanks for your kind words, Charlene. I appreciate them immensely!! Is this where M & M's gather? I want some! Gimme some! You took them all to Nova Scotia with you? What???? Darn, I was really having a little chocolate attack! Your card and story are the funniest! Giggle! That JoJot/ SnoSnot, she is something else! She pushed the whole crew overboard and is now safely navigating us to Peggy's Cove, told she would be a good guide! I am practicing my stuff Bertie, beware! I am on a mission to retain my stamping stuff! Giggle! I love seeing you at the tea parties on Tuesdays!!! Well it seems we were connected brain-wise today, GF! The difference is I brought NO presents! I had no idea gifts were to be involved!! I thought I was doing enough by bringing my fish-catching boat, but hey! What do I know? I intend to be standing on the dock watching everyone else fishing.......I got a crown today at my Dentist's, so there's the proof I am a QUEEN, and so I don't need to dirty my hands!! I just hope you are fishing today for all you're worth!!!!!!! Did I say I love your card??????? How cute is this! You have created the perfect scene for the fishing expedition! This is a mighty cute little tug boat, Charlene...hope it gets ya to the tea party!!!! What's the deal...taking presents??? For me??? You are sooo sweet!!!! I may even share a little Texas BBQ with ya unless you really want to eat that smelly old fish!! Yikes!!! This is both charming and beautiful Charlene!! I love your sweet little boat! And the lighthouse is a perfect addition!! I love your lighthouse behind your tug Charlene! and are those packages filled with stinky fishies???!!! see you in NS! they'll be able to smell us coming!!! How fun is this!! 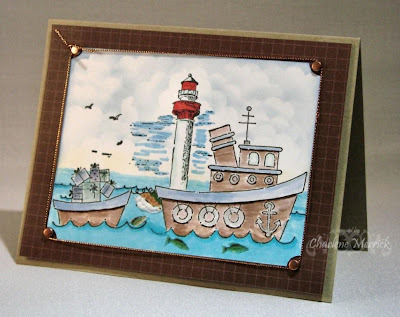 Love the scene you created with the light house in the background, Charlene!! You gals are just having too much fun at these tea parties! I need to come join you but I always seem to be too busy! I love your tug... I'm not sure about baiting my own hook... might feed the fish trying to do that! Thanks for stopping by my blog today! It was good to see ya! Hugs! Oh and give a hug to Peggy... that Peggy's cove is my favorite spot in Oh Canada!!! Wish I could REALLY go!!! This is so cool! Your scene you created is great and what a story. lol Great coloring and again such a cool scene.